Dr Santanu Das is Reader in English Literature at King’s College London, and the author of Touch and Intimacy in First World War Literature. In this blog post he explores the unique kind of male bonding that occurred in the trenches, confounding all our usual emotional and social categories. In the trenches of World War I, the norms of tactile contact between men changed profoundly. Mutilation and mortality, loneliness and boredom, the strain of constant bombardment, the breakdown of language and the sense of alienation from home led to a new level of intimacy and intensity under which the carefully constructed mores of civilian society broke down. As historian Joanna Bourke has documented in her exciting work on First World War and masculinity, men nursed and fed their friends when ill; they bathed together; they held each other as they danced, and during the long winter months, wrapped blankets around each other. These moments were often grounded in experiential reality, the nature of these encounters – men on the verge of death, under fire, or being ill – giving them an emotional nakedness and intensity that not only outlive their contingent nature but that continue to grow in emotional value and resonance. It is debatable whether these relationships were those of “comradeship” or personal “friendship” or trench “brotherhood”: each of these relationships had its particular nuance and value, though it is difficult to straitjacket human relationships and feelings, especially in times of physical and emotional extremity. Moreover, they were all forms of male intimacy during crisis with inevitable overlaps or continuity at times and touch seems to have cut across the range of these relationships. The conditions of trench life dictated that there could be moments of perilous intimacy between relative strangers: the trench journal Poil et Plume (October, 1916) records an incident where a severely wounded man fell on an unknown stretcher-bearer and said, “Embrace me. I want to die with you”. On the other hand, W. A. Quinton recalls how one night, as he lay shivering, “old Petch put his overcoat in addition to my own over me, taking care to tuck me in as a mother would a child.” A. F. B. notes, in The Third Battalion Magazine, that Smalley was the great favourite of the Third Battalion for “his heart was as big as his body – his strength like a lion’s – his touch to the wounded as a woman’s.” A new world of largely non-genital tactile tenderness was opening up in which pity, thrill, affection and eroticism are fused and confused depending on the circumstances, degrees of knowledge, normative practices, and sexual orientations, as well as the available models of male-male relationships. Many returned soldiers carried with them photographs of their dead comrades or small items that belonged to them; men such as Ivor Gurney remembered the voices of the men in his company, the “roguish words by Welsh pit boys”. And yet, the most intimate moments with the comrades were those of actual body contact. These soldiers are often haunted by the feel of their comrades’ bodies as life ebbed out and the warm mutuality of the embrace was lost forever. The most immediate and yet the most evanescent of human senses, touch could only be preserved in memory and through language. 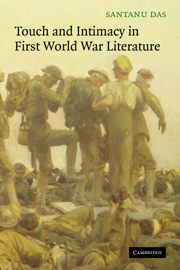 Consequently, there is the urgent need within war writings to remember and re-present these moments, to evolve a literary language around touch. This entry was posted in Five Hundred Years of Friendship by Santanu Das. Bookmark the permalink.